Sweet potatoes. Fresh from the oven, slipped out of their jackets, and mashed up good with plenty of butter and maple syrup. You have never tasted anything so good in all your life. Stories abound in the South recalling days when the sweet potato was the most regular and ready treat for drop-in visitors-just about everybody had plenty of sweet potatoes on hand, and everybody loved them. They have apparently been satisfying Americans for multiple millennia. When Columbus discovered the West Indies, he discovered the sweet potato too, taking it back to a delighted Europe, who preferred it over the Irish potato for well over two centuries. Spanish explorer Pizarro found the Incas and their predecessors had been cultivating the nutrient-rich root vegetable in South America for long ages, calling it the batata (soften the "b" to get "potata"). Yes, ladies and gentlemen, the true and original potato is the sweet potato-and the white potato, for all its familiarity, is not even botanically related. Nor are true yams, of course, but sweet potatoes have been called "yams" for so long in the South-nyami is the name for a similar vegetable grown in Africa-it would be about as hard to undo that nomenclature as it would be to stop calling potatoes "potatoes"! But a sweet potato by any other name is still the same old sweet potato, and it is unquestionably a Southern favorite. Sweet potatoes are a hot-weather crop, and they have been an important agricultural feature in the American South since colonial times. They are now grown commercially in California, but otherwise the traditional South-from Texas to Maryland-is the proper domain for this king of the healthy foods. North Carolina comes in first place, supplying nearly fifty percent of the nation's sweet potatoes, and they are proud of it: the sweet potato is their state vegetable. Mississippi and Louisiana come next in line as important sweet potato production states, but there are big sweet potato farms that do regional- and national-scale business in just about every other Southern state. One hundred years ago there were about thirty such farms in and around the town of Martin in Weakley County, Tennessee. Currently, there is only one big sweet potato farm there, but at the time they were the sweet potato hotspot in the South. In 1915 three sweet potato farming families from that area brought their sweet-potato-growing magic to the small-town farming community of Vardaman in north-central Mississippi. Today you will be hard-pressed to find a more sweet-potatoed place on the planet-which is likely why they have christened themselves the "Sweet Potato Capital of the World." What was once a collection of ten- and twenty-acre family farms is now a conglomeration of some of those same family farms grown to hundred- and thousand-acre proportions. 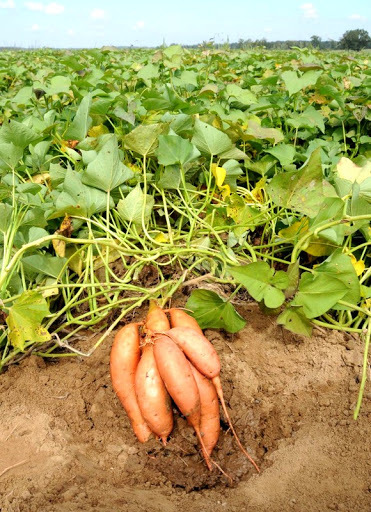 And just about all of those acres are planted in the sweetest, most flavorful, melt-in-your-mouth Beauregard sweet potatoes. Vardaman folks grow the morning-glory-look-alike sweet potato vines like grass. There are potato-packing facilities all up and down the main drag in town, and some of the farmers' wives got together a few years back and started a successful business in town called Sweet Potato Sweets-offering things like sweet potato pie, sweet potato bread, sweet potato butter, sweet potato fudge, sweet potato bon-bons, and even sweet potato dog treats. This little town is seriously sweet potato about almost everything. About mid-fall Vardamanites get serious about celebrating the sweet potatoes they have been growing and harvesting and selling all year long. For forty years Vardaman has been hosting an annual Sweet Potato Festival, attracting over 20,000 attendees from all over the South to this town of about 2,000. Kicking off the first Saturday of November, the week-long party includes live entertainment, an arts and crafts festival, a 5K run/walk, antique tractor judging, a sweet potato tasting booth, a sweet potato pie eating contest, a barbecued chicken and sweet potato dinner, "Sweet Potato King and Queen" contests, an original sweet potato recipe contest, and a sweet potato quilt auction. The last features a hand-stitched quilt donated by a group of Vardaman mothers and grandmothers, raising thousands of donated dollars for local projects in this below-national-average-income town. Those who have been say it is one of the best small-town festivals in the nation, and it is unquestionably one of the tastiest. The sweet potato has been good to the Vardaman community-just as it has to thousands of others throughout history and throughout the world. The hardy, drought-resistant vegetable is one of the seven most important food crops worldwide-the most important root crop. The sweet potato is relatively easy to grow even in poor soil conditions, it supplies more food in less area than any other crop, and literally nothing beats it for nutrition, all of which combines to make it an especially crucial staple for developing countries just as it has been for poorer rural communities in America's history as well. The healthiness aspect is a happy feature, of course, especially for an increasingly health-conscious American population. But when it is all said and done, the Southern sweet potato maintains its popularity because it tastes really, really good too-whether french-fried, oven-baked, or boiled on top of the stove, whether skins-on or mashed, and whether used as an ingredient in biscuits, baby food, pies, cakes, cheesecakes, cookies, quiches, or everyone's favorite Thanksgiving casserole. Vardaman may do it bigger and better than anyone else, but anywhere there is a tongue wrapping itself around a fork or spoonful of succulent and satisfying Southern-grown sweet potatoes, there is a sweet potato celebration about to begin of its own accord.